Whoever said you needed 10 widgets for all your RSS and Social feeds. 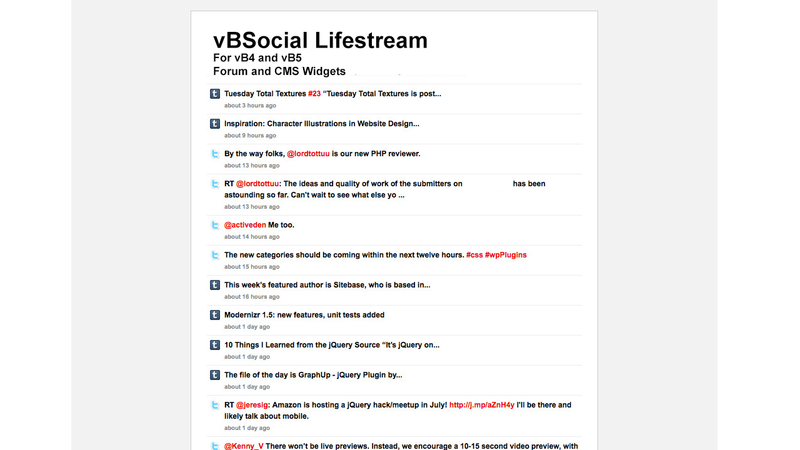 vBSocial Lifestream solves the issue of too many widgets taking too much space, and allows your users to focus on one area, which can drive all your external, and even internal feeds. You can combine your Facebook, Twitter, Digg, Youtube, and other social media feeds along with RSS feeds all into one widget. Its’ works with both the CMS and forum sidebar and is flexible with all sorts of column widths.